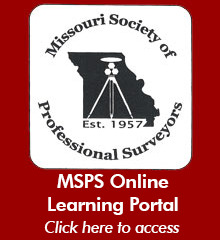 The purpose of the Missouri Society of Professional Surveyors (MSPS) is to represent the interests of and be a primary spokesman for the surveying profession in Missouri; to elevate the standards of the surveying profession in Missouri, thereby benefitting the general public; to insure that the general public and offices of records receive superior land surveying that bring about an upgrading of land records; to sponsor legislation and educational programs beneficial to the public and land surveyors; and to improve the professional recognition of the surveying profession by the public and by other related professions. A Professional Land Surveyor renders a highly technical service in compliance with applicable laws, regulations, codes and court decisions set forth by local, county, state and federal authorities. In order to protect the public from inferior land surveying, the "Missouri Minimum Standards for Property Boundary Surveys" have been established. These standards describe recommended procedures for a survey and the minimum information to be provided to the client. Consider the qualifications of a number of Professional Land Surveyors that appear to be capable of meeting the requirements of the proposed survey. Select from these surveyors two or three that you believe to be best qualified. Interview them separately, explaining fully the proposed service and carefully examine the qualifications of the surveyor, without discussion of cost. List the surveyors in order of desirability, taking into account reputation, experience, availability of personnel, timeliness and any other pertinent factors. Choose one deemed most desirable and then agree on a mutually satisfactory fee. In the event an agreement cannot be reached on the fee, dismiss the firm and negotiate with the next one on the list, and so on, until a surveyor is selected. Enter a zip code or choose your county.